Donostia-San Sebastián. Korrika began yesterday afternoon in the plaza in Gares, Navarre surrounded by an enthusiastic crowd. It was the beginning of a march that will travel 2,500 kilometers to arrive on April 14th in Vitoria-Gasteiz. 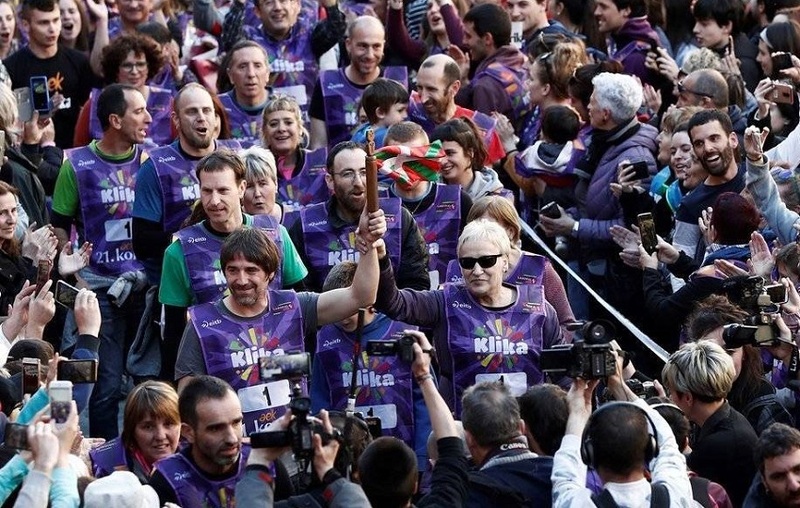 However, the race in favor of Euskera goes beyond these geographic and physical limits, thanks in large part to Basque clubs and Basque language and culture lectureships in universities all over the world. Basque speakers in the Diaspora also “Kliked” and from a distance made our contribution to Korrika and the Basque language. More Korrika activities in the Diaspora to add to those mentioned in prior articles. -Munich, Germany. Organized by the Munich Basque Association, Korrika will be on April 13 beginning at 5pm between Max-Joseph-Platz and Geschwister-Scholl-Platz. Before it begins, there will be an explanation in both Basque and German, followed by music to encourage the korrikalaris. Afterwards there will be dancing and kalejiras, and food at the Das Provisorium tavern. -Berlin, Germany. Organized by the Berlin Basque Club and the Etxepare's lecturership on April 13 beginning at 12:30 at Orienplatz, it includes music, animation, many people running and even a cultural program with a concert by Zea Mays. -Buenos Aires, Argentina. The Euskal Echea School will celebrate Korrika on Tuesday, April 9th with the participation of hundreds of children. -Graz, Austria. In Austria, Korrika will be on April 13 with the following program: 9:30hs: gather in Schlossberg; 10hs, begin Korrika (Schlossberg); 10:30hs, end of Korrika (Jakominiplatz- Hauptplatz); 11hs, group photol (Hauptplatz); 12:30hs, drinks; 15hs, lunch; 19:30hs, dance; 23:00hs, drinks at Dom in Berg. -Montreal, Quebec. The Euskaldunak Basque Club in Quebec invites everyone on Saturday, April 6th a 2pm. The departure will be from the Lafontaine Park. The festivities will continue at the Station Ho. St Bar (1494 Ontario), with the reading of a message from Basque students, following Korrika live, singing, music, and dance. More information, here. -Shanghai, China. The Shanghai Euskal Etxea invites everyone to participate in Korrika on April 13 with a tour that will link Qiandeng and the Euskal Etxea. In Qiandeng, where the Mondragon Cooperative is located, there will be breakfast for the korrikalaris that will later have to travel some 40 kilometers. The stages are organized in four groups. Lunch will be served at the Euskal Etxea once the relay is completed. -Edinburgh, Scotland Basques in Edinburgh will have their Korrika on April 13. More information, here. -Alicante, Spain. Students and teachers from the Language School in Alicante will celebrate Korrika on April 13th. -Mallorca, Spain. On April 6th the Euskal Etxea Artea invites everyone for the following activities at the Jordi Caldentey Plaza. Beginning at noon there will be Basque music and bertsolaritza with the “Gibelurdinek” group and bertsolaris Arkaitz Estiballes and Fredi Paia; 13hs, Korrika through the old part of Manacor. To conclude the group “Al·lots de Llevant” will take over and lunch will be served at 2pm. -Bordeaux, France. On April 7th at 11:28 am, members and friends of Bordaleko Euskal Etxea will travel to the Basque Country to join Korrika on Kilometer #694 between Mehaine and Garrüze. -Bristol, England. Several members and friends of Bristoleko Euskal Etxea will travel to the Basque Country to join Korrika on Kilometer #2467 during is passage through Erretana in Vitoria-Gasteiz, Araba and encourages other club members and friends in the Diaspora, as well as other euskaltzales to join them. -Pau, France. Members and friends of the Lagunt eta Maita Basque Club in Pau will travel to join Korrika on its arrival in Maule, the capital of Xiberoa. -Amsterdam, Holland. Korrika will be celebrated on April 7 with the following program: 13hs, departure from the Plaza Dam; 13:30hs, Korrika through the streets of Amsterdame to Oosterpark; 15hs, lunch and activities at Joe`s Garage; 19-20hs. -Liverpool, England: The Etxepare Basque Institute Lectureship at the University of Liverpool invites everyone to the campus on April 6 at noon. After Korrika there will be a snack. -London, England: Organized by the London Basque Society - Euskal Elkartea, Korrika will be celebrated on April 13. The club invites everyone to participate in this event at London Fields where there will also be food, Basque dancing and music and a symbolic Korrika.